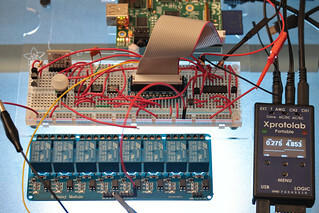 A lot of hobbyists are using Sainsmart relay boards with their projects because the boards cost less than buying the relays, or come really close. The boards include circuits to drive the relay coils so that a typical logic output can be connected directly to the board. Each driver circuit uses an optocoupler so that the driver and the coils only share a ground potential. This is a great scheme to allow the driver to work at a different voltage than the relay coils, but the board was intended for use with 5 volt supplies for both. The drivers start to work reliably from around 3.8V up to 5.5V or so. The result doesn’t work well with a 3.3V supply for the drivers operated by 3.3V logic; some relays will function, and others won’t. The solution is to give the drivers a 5V supply, but then the floating driver inputs should rise to 5V; the drivers are connected to the positive supply, and are two LEDs and a resistor in series that connect to an input pin. A common solution to using 3.3V logic with the Sainsmart board is to add another driver circuit to drive the driver circuit on the board. I thought that was annoying and sounded rather silly, so I investigated further and found a simpler method. I started by hooking up 5V supplies to the board and measuring the voltage of one of the driver inputs when left floating. This setup is in the picture; channel 1 (left) is measuring the voltage on a driver input, and channel 2 (right) is measuring the 5V supply. The first results showed a drop of about 2.2V from the driver’s supply. This occurs even when the only wire connected to the board, besides the measuring probe, is the positive power end, VCC, to the drivers. This voltage drop is made possible by the current passing through the probe; connect the probe’s reference potential to the board’s VCC instead of ground, and the voltage measured is zero. I measured using a 1MΩ probe. With the supply voltage measured at just over 4.8V, I get 2.5V on an otherwise disconnected driver input. The current flowing through the driver is adequate for the LED to make a very dim light. By switching the probe to 10MΩ (as pictured), the voltage measured is over 0.27V, meaning the voltage on the input is 2.7V. This indicates that a small current is all that is needed to keep the drivers below 3.3V when using a 5V supply. Connecting a 3.3V logic output directly to one of the board’s driver circuits should work just fine without adding an additional driver circuit. In many cases, though, some 3.3V processor is used and its general purpose I/O lines are initialized as inputs after a reset. Clamping diodes are often present and can probably handle the small current through the relay board’s drivers trying to pull the line to 5V. Adding a 10MΩ resistor to ground should save the clamping diodes from any work, while connecting it to the 3.3V supply should work almost as well while eating even less power. The small current draw of the input might actually take care of the problem, but I lack any measuring equipment that can confirm this without drawing the small current that will take care of the problem. I’ve been asked to post a circuit diagram for the solution I mention above, so here it is. I threw it together in Inkscape even though I don’t really know how to use Inkscape. The circuit will work for the Sainsmart relay boards like the one I tested when the drivers on the board are given a 4V to 5V power source.